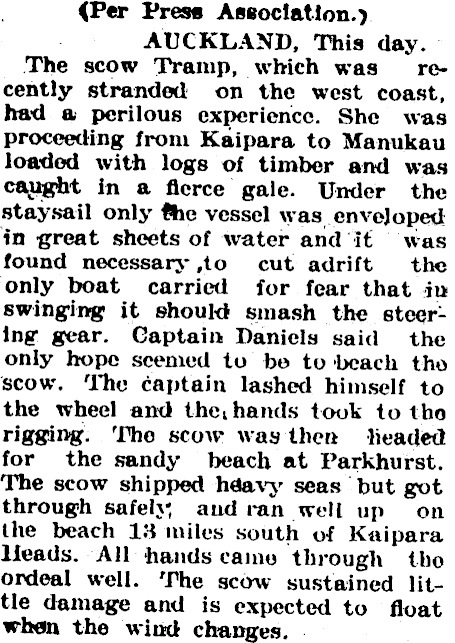 By 11am on the morning of June 25, 1907, the big scow ‘TRAMP’ with a deck load of kauri logs, assisted by an ebbing tide and moderate breeze from south east, cleared the Kaipara Bar on the west of the North Island, bound for Manukau Harbour about 40 miles south. Auckland Star 27 June 1907. The Tramp, owned by the Ford Shipping Line Auckland, was built for them by George Niccol in 1902. Her dimensions were 95.9ft by 27.4 by 4.4 She was schooner rigged, two-masted with a long spike bowsprit on which the following sails were set: a flying jib, inner and outer jibs and fore staysail. The fore mast had a large gaff foresail and gaff topsail, mainmast, a main gaffsail and main gaff topsail. Like all her class of this period she had no engines, and being flat-bottomed had fitted centreboards to assist progress to windward. Despite their ugly hull form these were extremely weatherly ships. Scale model of “The Tramp” currently in the Dargaville Museum. To return to the Tramp, by 3pm the wind shifted to the north east with rain and a falling glass. Under easy sail the ship kept going up and down the coast until sighting the light at Manukau Heads at 4am the following morning. With daylight and the flood tide the ship was expected to cross the Manukau Bar. Fate had other plans. As daylight advanced the wind backed to north west, increasing. All hands were called to reef down the ship, now about five miles off land. The north-west wind eased away and fell to a flat calm with the glass continuing to fall. By 8am the wind picked up, now from the south east with rain backing to south, increasing to a gale then settling from south-west. Sail was reduced, but the foresail split from head to foot. The ‘Tramp’, now under fore staysail only, was in a desperate situation trying to claw off the coast down to leeward. The course was altered towards Kaipara but with little hope of entering there. New Zealand Herald 28 June 1907. The huge seas now building and crashing over the ship as she laboured along were causing anxiety about the lifeboat which hung in davitts across the stern. This would be a source of danger to the steering gear and the helmsman should it come adrift and crash inboard, so it was abandoned. With the lifeboat no longer a threat, oil and kerosene were used in an effort to prevent seas breaking aboard. This had some effect but the ship was still on a lee shore. A tremendous sea created by the gale was breaking over the dangerous Kaipara Bar shoals up to five miles off the entrance, and a desperate situation now confronted the master. The only sail, in addition to the fore staysail the ship now carried to help her clear the land, would be the reefed fore gaffsail. As this had been damaged there was little that could be done to avoid the shoals, other than try to beach the ship. 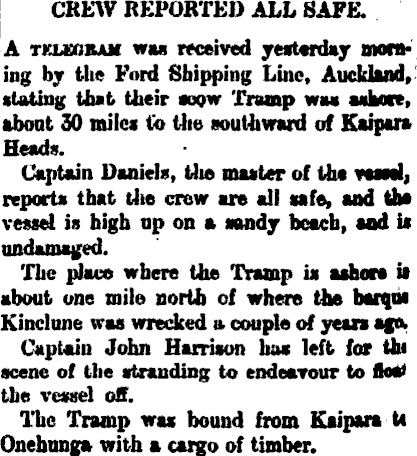 Bay of Plenty Times 01 July 1907. When this decision had been taken the centreboards were hove up, the four crewmen ordered into the fore rigging and the ship, squared away dead before the wind and sea, headed for the beach. The master was secured with a lifeline around him at the wheel. 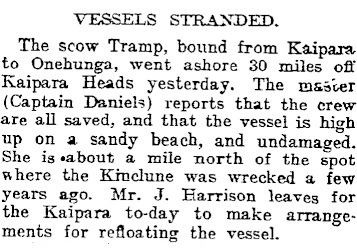 At 1pm on June 26, 1907, the Tramp grounded safely through the surf ten miles south of the Kaipara entrance, and about a mile from where the barque Kinclune had previously gone ashore. Apart from the lost lifeboat and the split foresail the Tramp sustained no damage apart from flooded quarters in the after end. The cargo of deck logs was intact despite their 120 ton weight. The master, my father, was Captain Charles Daniel who had served his time in deep water square rigged ships. He was 23 at the time. In addition to the four crew there was a spaniel called Rags, a cat and a pig, all safe also. A camp of spare sails was established ashore, and sleeping and cooking facilities established. The master set out over the sand-hills, walking ten miles to the nearest homestead. From there the owners in Auckland were informed. New Zealand Herald 01 July 1907. The kauri logs were unloaded and brought by bullock teams from the beach to Kaituna Creek at the southern end of the Kaipara Harbour. From there, they were rafted to Helensville and finally railed to Auckland. Eight months later in February, 1908, the Tramp was re-floated on a high spring tide with an easterly wind assisting. Captain Daniel again assumed command, remaining in charge of her another year. 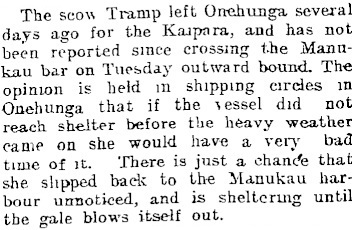 He carried logs and sawn timber from the Northern Wairoa River on the Kaipara Harbour to Onehunga, without further mishaps. Eventually the Tramp was sold to Australian interests. She went under sail loaded with sawn timber, which shows just how seaworthy the lowly scows were. The Tramp was finally lost on North Head, Sydney Harbour, in 1915.